At the Civilian Conservation Corps camp at Burlington, Kan., recruits end their duty day with a retreat ceremony. Photo from Bevitt collection. The outlook at the start of the 1930s was shrouded in a cloud of economic failure and dust as a result of the stock market crash of 1929, drought, and poor soil conservation practices. Unemployment had risen to 25 percent by 1933, and while that did not affect farmers, the dropping crop and stock prices did. The great clouds of dust that were forming on the horizon were a result of the wartime effort after 1914, during which the amount of acreage devoted to wheat was greatly increased, also known as “The Great Plow Up”. The combination of drought, overgrazing of pastures and poor conservation practices overall led to a period of massive dust storms led to the region being called the Dust Bowl. When President Franklin Roosevelt took office in 1933, he immediately set in motion work relief programs to deal with the dire financial situation facing the country, one of which was the Civilian Conservation Corps or CCC. The CCC focused on conservation projects, a subject Roosevelt had previously shown favoritism towards during his tenure as governor of New York. The CCC not only put unemployed young men to work, but also increased their employability through education and experience on the many public service projects performed by the various camps. There were generally three different types of CCC projects in Kansas: soil erosion, lake creation or maintenance, and those focusing on reforestation. A CCC promotional image depicts the hard labor of Corps’ enrollees’ service projects. 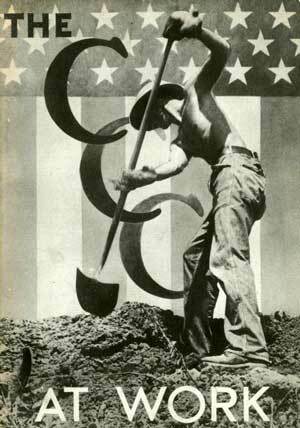 The CCC was one of the most publicly popular programs of the New Deal Era. 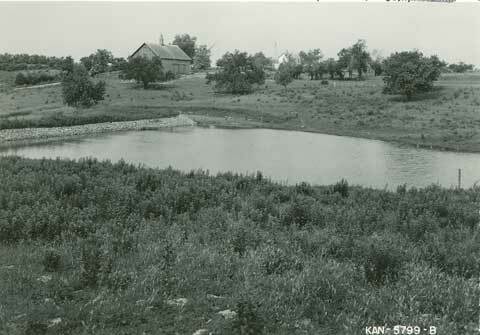 Lyon County had gained one of the first Kansas CCC camps in 1933, and worked to create what is now Lyon State Lake. This camp caught the interest of Lyndon Herald editor, Oscar J. Rose, who covered it not only for the newspaper, but captured scenes of the camp on film. Efforts in Osage County towards natural resource conservation were already underway when rumors began to spread in early 1940 that a CCC camp would be established in the county to assist in projects on private lands throughout the area. Later in the spring a camp was approved for the area, and by early summer CCC officials arrived to locate a suitable campsite and begin construction using a small band of CCC men for labor. The Osage City camp was thought to be receiving a junior company composed of single men ages 18-28. Enrollees were provided with room and board and paid $30 per month for their work on projects. Other enrollees in the CCC were war veterans of the Spanish-American War or World War I. While provision under the establishment of the CCC was not made for veterans initially, President Roosevelt eventually made an allowance for the enrollment of 25,000 veterans by signing an executive order as a concession to marches on Washington, D.C., of what was termed “The Bonus Army” or veterans who were seeking payment on their service certificates. Ultimately, veteran Company No. 4718 was reassigned from Kingman County, where a project was being completed. This switch was apparently due in large part to a shortage of housing needed for the sizeable group of families that accompanied the company, whose members included many family men. The camp in Osage County was the last CCC camp established in Kansas, beating out a camp in Pawnee County by a day for that distinction. 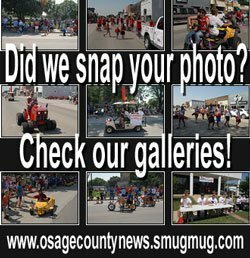 The creation of the Osage City camp was born out of the recent establishment of a soil conservation district within the county. This camp’s responsibility was to combat soil erosion and establish water conservation practices. The camp was located on the western limits of Osage City on property acquired by the city for the purpose of housing the camp. By this point in time, the CCC camps were of a prefabricated standard design, easily dismantled at the end of a project and readied to be sent to a new location. 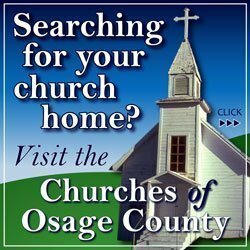 The Osage City structures came from a recently closed camp in Jefferson County. 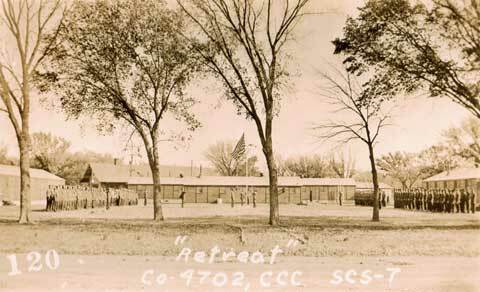 Five barracks were included at the Osage County camp, in addition to the project headquarters, mess hall, recreation hall, education building, officers’ and foremen’s quarters, bath house, hospital, and project garages and sheds. More than two miles of brick walks were laid by the CCC men around the camp compound, and the camp was arranged around a central parade ground. The camp at Osage City closed in 1942, and the CCC reached its own conclusion at the end of June that same year with the shifting of manpower towards World War II. 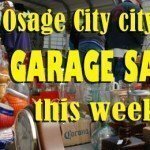 With the closure of the Osage City camp, the community used some of the buildings for things such as a community building or city storage. Part of the county fairgrounds was established on the property also. Several of the buildings were still present in the 1960s, but ultimately the remaining buildings were removed. The vicinity of the former camp now includes a swimming pool, newer community building, paved and gravel parking lots, and a high school track and football field among other community developments. While the evidence of the CCC and their time in Osage County might not be visible today, the impact of the soil conservation practices they brought to the area still remains. Photograph from the CCC era shows the Bainer Pond, an example of the soil erosion projects the CCC would have built. Photo from the Franklin County Conservation District. Wendi Bevitt is owner of Buried Past Consulting LLC. She lived in Osage County for 20 years and her research interests include Osage County Civil War veterans and Osage County history.